Followers of the campaign leaped after Emma Watson's speech went viral. Post by He For She. Most of the people who have been on the Internet over the past few days (that would be most of the people) know that the UN Women’s HeForShe campaign launched this weekend. Ogilvy PR, which worked on the media effort to launch the campaign, says social media played a big role in getting the word out. “Social media really drove it,” said Jen Risi, MD of Ogilvy Media Influence and North American head of media relations for the firm. According to numbers Ogilvy sent our way, HeForShe saw an 82 percent increase in Twitter followers within 24 hours of the Saturday launch, a 305 percent increase in Facebook likes, and a 3,500 percent increase in Instagram followers. As of this writing, Facebook followers total 125,878, IG followers have reached 10,640 followers and the campaign’s Twitter account has 62,000 followers. 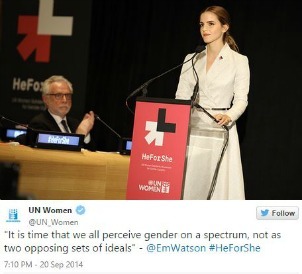 A big part of that has to do with the celebrity power of Emma Watson, the Goodwill Global Ambassador for UN Women. Video of her powerful speech has gotten more than 765,000 views. And the Emma effect didn’t stop there. Media outreach also went traditional, starting with an AP placement on Saturday and photo coverage of the after party by Getty Images, Wire Images and the AP. The coverage spanned across 500 outlets. Risi also credits UN Women’s executive director Phumzile Mlambo-Ngcuka for taking the premise of HeForShe in a different direction. “She wanted to turn the situation on its head,” said Risi. From their first moments working together back in January, Mlambo-Ngcuka wanted to reach out to men. And so far celebrity men like Russell Crowe, Simon Pegg, Chris Colfer and Tom Hiddleston have shown their support. The campaign’s goal is to get one billion pledges on the HeForShe website in the first year. They’ve already gotten 80,000. And UN Secretary General Ban Ki-Moon was the first to pledge. When asked about any challenges to the campaign, Risi said there were none, as we suspected. Good cause, celebrity names, timed to the UN meeting this week… Sounds like a slam dunk. And one more time for the cause, Tom Hiddleston.